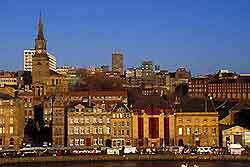 Newcastle is a particularly attractive and dynamic city, offering an impressive selection of attractions and places to visit. The biggest city standing in this part of England, Newcastle was previously known for its industrial centres and has been transformed into a city of culture, with museums, galleries, sports venues and an array of theatres. Containing the highest number of listed historical building in the whole of the United Kingdom, central Newcastle has much to offer, with superb facilities, fine dining, a pulsating nightlife, and scenic surrounding countryside, just a short distance from central Newcastle.